Saturn is measured as obstructive force. Unfavorable transit of Saturn can lead to squeeze on inflow of money for you. If you are eyeing for big ticket financial gain, you need support from hard task master Saturn. Weak Saturn does not give right orientation. Heavy financial loss is triggered by weak Saturn. 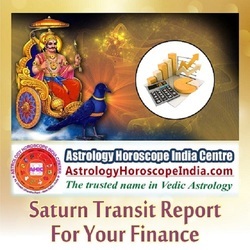 Saturn teaches you about virtue of prudence and cautiousness in matters related to finance. If Saturn has influence over the second house linked with finance mainly, you need to plan finances with long term in view and keep enough provision for contingency.